Investor weariness about trade talks, the Federal Reserve, a government shutdown, and global economic growth lingered into the New Year. 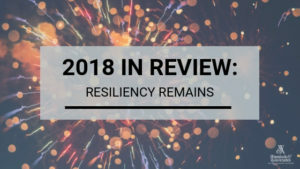 Despite the turbulent end to 2018, the U.S. economy continues to be resilient into 2019. Unemployment is at its lowest level in 49 years, wage growth is reaching levels not seen since 2009, and consumer spending and industrial production remain strong. A tight labor market and moderate inflation has been good for consumers. 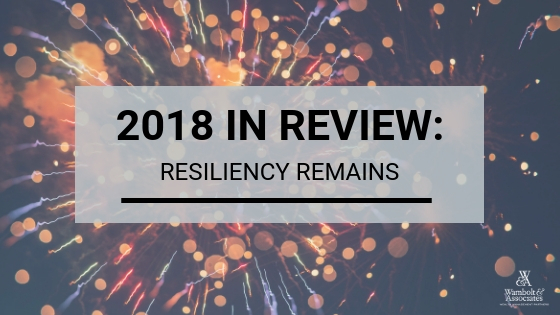 The year-end climate heading into 2019 was made all the more challenging as equity markets negatively reacted to another rate hike in December and news of two more expected hikes in 2019. Ironically, the market views the Fed hikes as a validation by the Fed that U.S. economic activity is healthy enough to endure further rate increases. Global equity markets ended 2018 in negative territory; nearly every major index in both developed and emerging markets fell. China’s stock market was among the worst performer internationally as trade tensions took a toll on Chinese manufacturers and exporters. U.S. stock markets experienced a level of volatility not seen in several years, resulting in a pullback for all major domestic equity indices in 2018. Ongoing trade disputes and new tariffs negatively influenced the markets and economic projections throughout year. Relations with China were forefront as the administration negotiated trade terms intended to better protect U.S. intellectual property and disparate tariffs. Growing U.S. oil production and an increase in supplies led to a drop of U.S. oil prices by 25% in 2018. The benchmark for U.S. oil, West Texas Intermediate (WTI), fell from $60 per barrel in the beginning of the year to $45 per barrel by year-end, simultaneously reducing the price of gasoline nationwide. According to the Federal Reserve Bank of New York, the likelihood of a recession remains relatively low with a yield curve that shows a 21% probability that one will occur within the next 12 months (last updated January 9, 2019 with data through December). Although up from 15% in November 2018, the Fed has historically seen greater than 30% probabilities before each of the last seven recessions since 1970. This commentary on this website reflects the personal opinions, viewpoints and analyses of the Wambolt & Associates employees providing such comments, and should not be regarded as a description of advisory services provided by Wambolt & Associates or performance returns of any Wambolt & Associates Investments client. The views reflected in the commentary are subject to change at any time without notice. Nothing on this website constitutes investment advice, performance data or any recommendation that any particular security, portfolio of securities, transaction or investment strategy is suitable for any specific person. Any mention of a particular security and related performance data is not a recommendation to buy or sell that security. Wambolt & Associates manages its clients’ accounts using a variety of investment techniques and strategies, which are not necessarily discussed in the commentary. Investments in securities involve the risk of loss. Past performance is no guarantee of future results. Wambolt & Associates provides links for your convenience to websites produced by other providers or industry related material. Accessing websites through links directs you away from our website. Wambolt & Associates is not responsible for errors or omissions in the material on third party websites, and does not necessarily approve of or endorse the information provided. Users who gain access to third party websites may be subject to the copyright and other restrictions on use imposed by those providers and assume responsibility and risk from use of those websites. Greg Wambolt and the entire Wambolt team employ a multi-advisor approach to provide clients with a high level of tax, estate, and investment advisory services all under one roof. Disclaimer: Wambolt & Associates is a Registered Investment Adviser. Advisory services are only offered to clients or prospective clients where Wambolt & Associates and its representatives are properly licensed or exempt from licensure. This website is solely for informational purposes. Past performance is no guarantee of future returns. Investing involves risk and possible loss of principal capital. No advice may be rendered by Wambolt & Associates unless a client service agreement is in place.